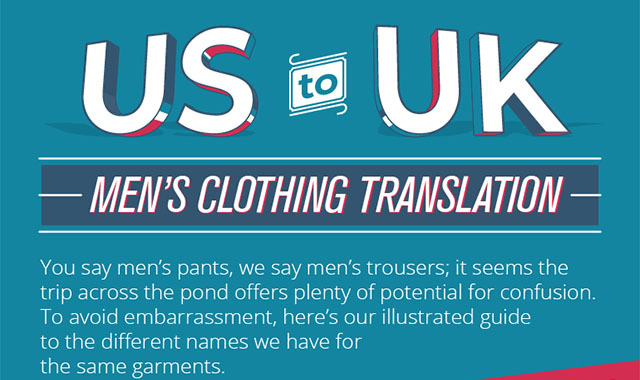 Lost in Translation: English Vs American Men’s Clothing Terms #Infographic ~ Visualistan '+g+"
The differences between British and American English are many: in some instances, the changes seem forced, like removing the ‘u’ from favour or colour; sometimes, they raise a good laugh and some embarrassment – like the contrary meaning of ‘fag’ in the two languages! But, nowhere is the differences between British and American English more felt than when talking of men’s attire. In England, if you tell a guy you like his pants, watch him go tomato-red with awkwardness – after all, no self-respecting Brit discusses his underwear! Read on for some more Anglo-American attire-bloopers!